Last night the winds came howling though our town with the force of a thousand horses. The news reports gusts of up to 87 miles per hour. I can say with out a doubt that wind is my least favorite weather phenomena. There is something about the continuous howl, sifting through the cracks in windows, the force of air thrown against a building. It makes me anxious and unsettled. It is the worst at night. It isn’t fear that keeps me awake, but just the feeling of unease. Being pregnant doesn’t help. Last night I was so antsy and uncomfortable I wanted to crawl out of my own skin. This appears to be a pretty common feeling among pregnant women. I went to the dr. on Monday. She was very excited for me, and confirmed the pregnancy and sent me for an ultrasound. I was not surprised when the typical belly ultrasound wasn’t showing what needed to be shown. Enter “the wand,” if you have been reading the news lately you will know what I am talking about. If not…well look it up. It isn’t pretty. So after being poked and prodded, a black area appeared along with a teeny tiny white dot of flutter. Hello Sea Monkey. They reported back that I am 6 weeks along. Very early, very much not out of the danger zone in any way. 6 weeks, for all of you out there with irregular cycles, dealing with PCOS, this should come to no surprise, but my cycle was off by two weeks what a normal cycle would be. So without an ultrasound it was impossible to judge how far along I was. Which means that by the time we actually conceived this baby, we had already gave up trying. As such, this baby is a fluke. I am doing pretty well. I only have occasional nausea so far. A kid in class today was eating something, and just looking at it made me go green. I have an aversion to vegetables. Any plant material is enough to turn my stomach. I also am having problems with red meat. Not so much that I get sick, but the thought of eating it makes me slightly queasy. But bread and cheese I can do. I like to eat sourdough toast with butter and a banana. I like grilled cheese sandwiches. All of these things are not on the pcos plan, which is a shame. I am having trouble finding meals that I can stomach that are on the plan. Fruit and chicken….but I am afraid that might get boring. I don’t really know what to do other than just use the old, “I’m pregnant and am going to eat what I please” card. Tonight is parent teacher-conferences and I don’t think I will be able to make it through. I am sure many of you have come up against this problem, but it is hard to keep this a secret. My co-worker comes in and says, “hey, do you want to go and get coffee before conferences start?” which is our tradition. Um, no…I am not drinking caffeine. “huh? Why?” can I tell you later? Like that isn’t the biggest tip-off of all time. I am so so tired. I am having trouble keeping my eyes open to write this. I slept badly last night because of the wind, and this is so draining. I don’t think I can make it another 2 hours and 15 minutes. I am thinking of pulling the pregnancy card again, and going home early. No one comes to talk to me anyways. The picture is a view outside my school window and the red dust that has sifted through and onto the window sill. This week I found myself staring into the freezers at the grocery store. To what was my attention drawn? Chicken Nuggets. Stupid, processed, sodium-preservative-filled nuggets. I knew that there were cravings but this was the end all and be all for me. I cannot recall a moment in my life where I have ever hovered over these frozen balls of minced chicken and thought it was a good idea. But you know what? This pregnant chick-a-dee walked away from the freezer and to the meat case and grabbed some real chicken tenders and came home and made her own. Officially this is not PCOS friendly, but when you are pregnant and want chicken tenders you might as well make them yourself. Prepare to fry the chicken: Fill a medium heavy pot halfway with oil (enough to cover chicken). Heat until a deep-fry thermometer reaches 340 degrees. Meanwhile, make the coating: Stir together buttermilk, eggs, baking powder, and baking soda in a medium bowl. Whisk together flour, coarse salt, and cayenne in another bowl. Working in batches, dip each chicken piece into buttermilk mixture, coating completely (do not shake off any excess). Dredge in flour mixture, patting onto chicken to coat completely. Transfer to a plate. Serve the chicken: Transfer chicken to paper-towel-lined plates, and let drain. Season with sea salt, and serve with honey for drizzling or dipping. I have been having many ups and downs. Sometimes I feel like I am not pregnant at all and the tests must have been wrong, other times (like today) I feel worn out and tired. I don’t have any sickness to speak of. Occasionally I feel a bit sick, and I certainly am having a hard time at work. If it was stressful and overwhelming before, it seems almost unmanageable now. If you haven’t noticed. We eat all sorts of varieties of food at our house. We are so lucky to have the opportunity to try and to make different foods from around the world. Last night I made a quick and easy Thai Chicken soup. I am including a picture of the curry that I use. 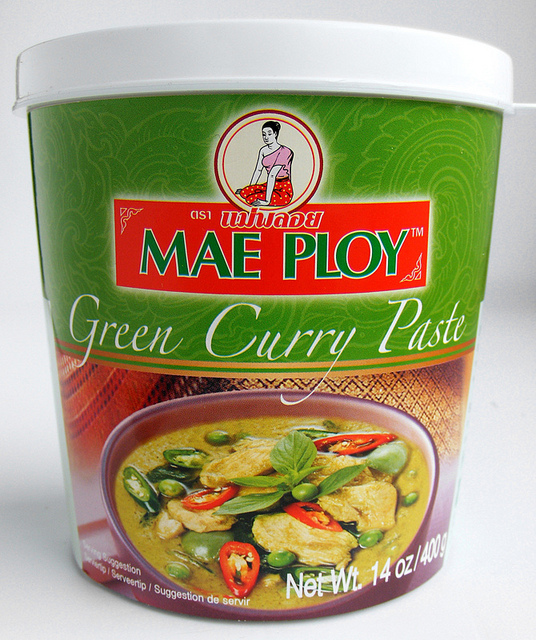 Inside the tub is the most beautiful green curry paste, and all of the ingredients are whole, no chemicals. 2. Place a well fitting lid over the top, and let simmer until chicken is cooked through. 30 minutes or so. 3. Uncover and add the rest of the can of coconut milk, and the fish sauce. Adjust the salt and pepper to your liking and add just a dash of sugar. Today we had a faculty meeting. There is nothing in the world that can make me more angry and sad than a faculty meeting. Sometimes I feel like I am on the forefront of a failing education system with no ammunition. Yep, just shoot me now because I am powerless to do anything. It seems that people with little to no real-world teacher experience bring down these “best practices” and tell me how to do my job. The trouble started when people ceased to be people (and by that I mean the students) and started to be commodities that could be data pointed and tracked. As a teacher my job is so much more than what data points I reach, or standards I post on my board. You can’t quantify meaningful relationships. Each kid comes to my room with different strengths and abilities. A good teacher recognizes these inherent strengths and weaknesses and adjusts the curriculum to support them. The system is so intent on producing manufactured human beings they lose sight of the beauty that is our differences. One size does not fit all, not for kids and not for the teachers that dedicate their lives to helping them. On a brighter note, one of the kids mentioned me as their favorite teacher in the paper and said very nice things. Those are the little things that keep me going. 1. Open up the chicken cavity and put some salt and pepper inside the bird. The place garlic cloves and butter inside and seal. 6. Take chicken out and drain off pan juices and prepare the sauce. While chicken rests, Place skillet over medium-high heat, add 2 tbs of fat from roasted chicken add onion, and cook until softened, about 2 minutes. Stir in broth and mustard, scraping skillet bottom with wooden spoon to loosen fond. Simmer until reduced to ¾ cup, about 3 minutes. Off heat, whisk in butter, tarragon, and lemon juice. Season with pepper to taste; cover and keep warm. Serve with chicken. Around this house Indian is a favorite. It doesn’t matter what day of the week or the season of the year. Indian food is always in demand. Maybe it is the homey and rich spices, maybe it is a touch of the exotic, or perhaps it is just Indian food is a perfect combo of all the wonderful things food has to offer. 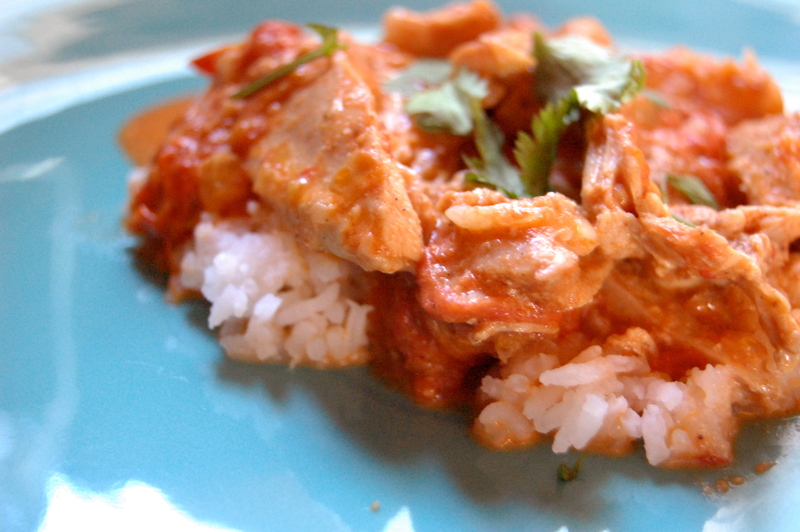 Tikka Masala is not authentically Indian, as it was invented in a London Curry house, but regardless…almost nothing is as satisfying on a cold evening. Usually this recipe is a quick meal, coming in at around 45 minutes. But I made it this time with garden tomatoes from this past summer. There is something quite depressing about living at over 5,000 ft in elevation, and that is a short growing season, especially for tomatoes. My tomatoes don’t being to ripen until well into August, at which time Summer has blossomed and already started to fade as I head back to school. So as the tomatoes are coming in, and we can’t possibly eat all that the garden has to offer, I gently place them in ziplock bags and lovingly store them in the freezer until a perfect recipe comes along. When that day comes you simply pull the tomatoes for the freezer, run them under some warm water and the skin comes right off . I then tossed them in the pot of simmering spices and onion and let them defrost in the pan. The rice is optional, as we know that people with PCOS should watch their carb intake. I enjoy mine without the rice, but some family members may not share the same affliction. FOR THE CHICKEN: Combine cumin, coriander, cayenne, and salt in small bowl. Sprinkle both sides of chicken with spice mixture, pressing gently so mixture adheres. 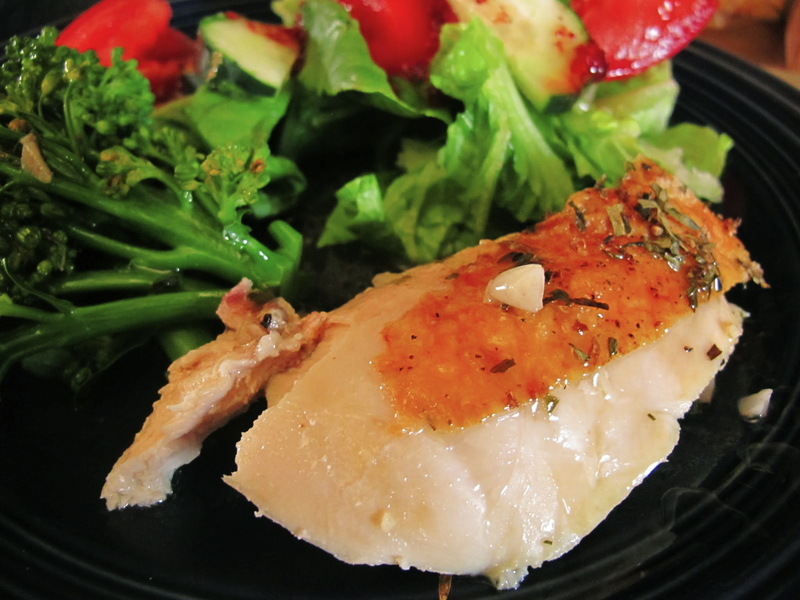 Place chicken on plate, cover with plastic wrap, and refrigerate for 30 to 60 minutes. In large bowl, whisk together yogurt, oil, garlic, and ginger; set aside. FOR THE SAUCE: Heat oil in large Dutch oven over medium heat until shimmering. Add onion and cook, stirring frequently, until light golden, 8 to 10 minutes. Add garlic, ginger, chile, tomato paste, and garam masala; cook, stirring frequently, until fragrant, about 3 minutes. 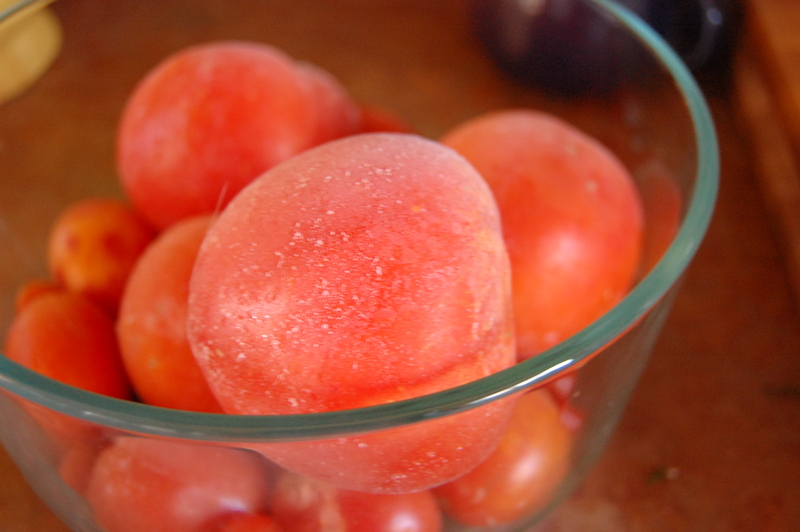 Add crushed tomatoes, sugar, and salt; bring to boil. Reduce heat to medium-low, cover, and simmer for 15 minutes, stirring occasionally. Stir in cream and return to simmer. Remove pan from heat and cover to keep warm. Well maybe it all it takes is a bit of complaining. Two fabulous farm fresh eggs from my backyard. If you wake up early enough they are still warm when you collect them. It seems so sad that we are so detached from our food source that an egg seems like a foreign occurrence. We should be collecting an egg once a day from here on out, and as soon as the other chickens are old enough we will be collecting up to 4 a day. Over medium heat bring 2 to 3 inches of water to a boil/simmer in a skillet. Pour in vinegar, 1 tsp per cup of water. crack single egg into liquid measuring cup, be careful not to break the yolk. Pour egg carefully into water. Repeat with the rest of the eggs. Turn off heat and cover. Wait patiently until the yolk has set to your desired hardness. J. likes the yolk to be mostly set, but still a bit runny. 7 minutes or so. Preheat oven to 400°F. Place squash cut side up in an ovenproof pan. Drizzle with oil and brown sugar. Season with salt and pepper. Bake until squash is tender and golden brown, about 45 minutes. In a soup pot, sauté onion and apple with 2 tablespoons of butter until it is translucent. 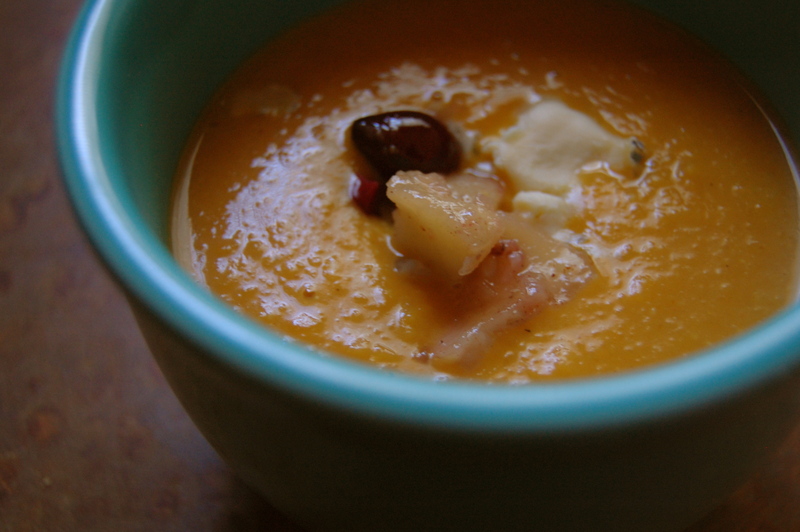 Using large spoon, scrape squash into soup pot with onions and apples. Discard peel. Add 3 cups chicken stock and curry powder. Simmer for 10 minutes. Mix in cream and lemon juice. Add mixture into a processor or blender. Puree until smooth. Finish by whisking in 4 tablespoons of chilled butter. Stir soup over medium heat until heated through. Season to taste with salt and pepper. Top with Apple Bacon Compote from previous entry and crumbled blue cheese.